SAN FRANCISCO -- The first images of the newly discovered wreckage of a steamship that sank in San Francisco Bay in 1888, killing 16 people, were released Wednesday by federal ocean scientists. The iron and wood steamship City of Chester went down on Aug. 22, 1888, after it was struck in dense fog by a larger ship. The collision came soon after family members bid their loved ones safe passage and the Chester departed with 106 passengers for Eureka, Calif., and Portland, Ore. Moments later, it was split in two by the Oceanic, a ship more than twice its size, killing 13 passengers, including two children, and three crew members. More than 125 years later, a National Oceanic and Atmospheric Administration team found the shipwreck in 217 feet of water just inside the Golden Gate Bridge while the scientists were charting shipping channels. 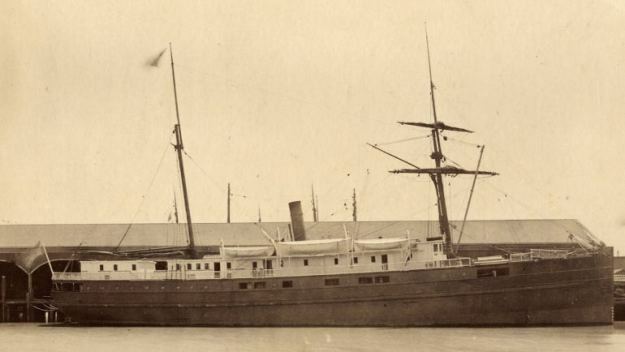 The Chester was actually discovered while the team was surveying another nearby shipwreck, the freighter Fernstream, which sank after a collision in 1952, according to CBS San Francisco. A display featuring the images and history of the shipwreck is planned at San Francisco's Chrissy Field, which looks out over the spot where the Chester sank, just in front of the Golden Gate Bridge. Laura Pagano, a member of the NOAA team, said she became emotional while learning they had found the wreckage. "It was sad in a way because of the loss of life," she said, with the Golden Gate looming behind her. "But to be able to connect with maritime history from a wreck found ... more than 100 years ago was immensely fulfilling." The crew used a multi-beam sonic imaging system to capture three-dimensional images of the wreckage. The NOAA researchers then put together research about what happened, and found tons of newspaper articles and transcripts of testimony from the accident investigation. James Delgado, a NOAA shipwreck researcher and archaeologist who was chief scientist for the 2010 mapping of the Titanic, said newspapers at the time put much of the blame for the deaths on the crew of the Oceanic immigrant steamer that survived the ordeal with a few dents in its hull. NOAA scientists, however, say much of the newspaper coverage failed to include witness accounts of heroism, and that the official investigation faulted the Chester's skipper with the accident. "The papers initially reacted, talking about the tragedy and accusations that the Chinese crew stood by and let people drown," Delgado said. "But what happens is you start to see things also come out ... countering that. Some leapt in water to save a drowning child." At the time, San Francisco Bay was one of the world's busiest and most important shipping ports. While there was fog when the Chester set off, research showed the seas were calm except for a strong incoming tide that created a rip current off Fort Point that affected the Chester's ability to move quickly. The two ships spotted each other when they were about a half-mile apart but failed to reverse their engines in time. The Oceanic's bow went 10 feet into the hull of the Chester, and the Oceanic's captain kept some momentum in the ship to keep the hole plugged in an effort to give people a chance to escape. Still, five or six minutes later, the Chester was gone. "The Oceanic crew was up on the bow reaching down to survivors on the Chester, lifting them on the deck," said Robert Schwemmer, NOAA's West Coast regional maritime heritage coordinator. "After the collision, in five or six minutes, the Oceanic crew went on to save a lot of people." It was the second worst maritime disaster to occur inside the bay in terms of loss of life, NOAA said. The worst was the SS City of Rio de Janeiro, a steamer that struck a reef inside the bay and led to the deaths of more than 120.